Women's head basketball coach Dan Raymond also serves as an assistant coach for the softball team. Dan Raymond, women’s basketball head coach, is used to being the man in charge. On the basketball court, his 19 athletes call him coach and look to him to make the tough calls in every situation. 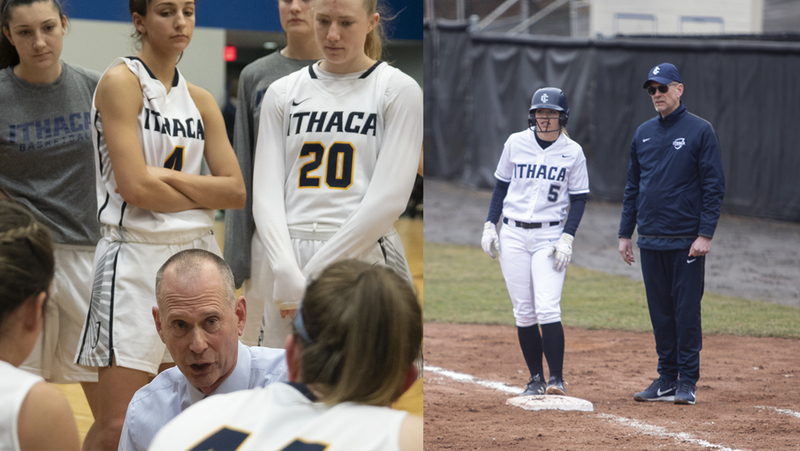 However, when the basketball season concludes, Raymond becomes Dan to the players of the Ithaca College softball team as their assistant coach. Raymond began coaching basketball at the college in 2000 and has been a member of the softball staff for over a decade, helping the team to the NCAA World Series in 2008 and 2010. He has served the entire duration of his time under head coach Deb Pallozzi. Before beginning his career as a collegiate assistant coach, Raymond had no experience with fast–pitch softball. He was introduced to the sport as the junior varsity and assistant basketball coach at SUNY Cortland. While there, Raymond was asked to coach the softball team’s junior varsity program by Julie Lenhart, Cortland’s head softball coach. Raymond said he had played recreational baseball and softball in the past but had to learn the game of collegiate softball while simultaneously trying to coach players. He said that pitching was especially difficult for him to grasp, so he reached out to pitchers on Cortland’s varsity squad and had them teach him about the mechanics and techniques. When Raymond first started as the women’s basketball head coach, most assistant coaches at the college were also assigned to an assistant coach of another team. Gregg Hepler, the men’s basketball assistant coach at the time, was an assistant coach for the softball team, but when he suffered a back injury and was unable to fulfill his obligations, Raymond offered to step in. Raymond said he was motivated to take on the responsibility by a disappointing 2005–06 basketball season. Women’s basketball coach Dan Raymond signals for a foul during the Bombers game January 25. Raymond said that during his time with the softball program, he has become a sounding board and source of wisdom for Pallozzi. Raymond said Pallozzi looks to him during in-game situations, especially defensively. He said he often offers suggestions about the positioning of outfielders, how to pitch to certain batters, and other small details that can make the difference between a win and a loss for the team. While basketball requires tight-knit team collaboration, softball is a much more individual sport in which each player is relied on to contribute to the overall success. But Raymond said he can often apply his coaching techniques from basketball during the spring season. Sophomore outfielder Gabby Laccona said Raymond differs from other coaches she has had in the past because he is not as concerned with the technical aspects of the game but instead focuses on the mental side. Coming from the high–pressure role of leading the women’s basketball team, Raymond said he enjoys stepping back to the position of an assistant coach. Pallozzi said that Raymond’s head coaching experience allows them connect and work well together. Raymond attributed his ability to successfully transition between his two roles to the flexibility of the softball coaching staff. He said Pallozzi is understanding that basketball has to be his priority, and she is always reasonable with her expectations for him. Raymond looks on during the softball team’s game against Clarkson University. Though coaching across two seasons is a significant time commitment, Raymond said, the most important aspect of the job, to him, is the bond that he forms with his players. He said that although different, he equally values his personal connections with both the softball and basketball players. Junior outfielder Abby Shields said that the team looks forward to seeing Raymond at practice when he finishes basketball season and that they respect his input when he does return to the diamond.